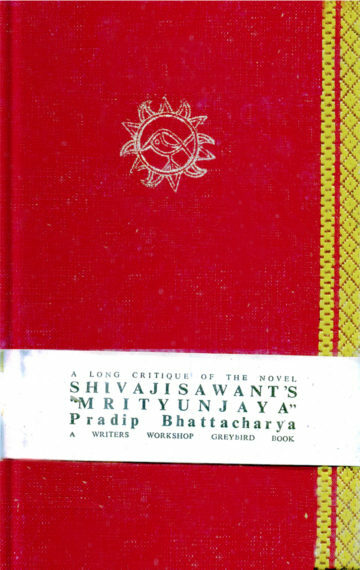 Mrityunjaya is the autobiography of Karna and yet it is much more. Sawant brings into play a remarkable stylistic innovation of combining six “dramatic soliloques” to form the nine books of this novel of epic dimensions. Four books are spoken by Karna and are interspersed with a book each from the lips of Kunti, Duryodhana, Shon Shatruntapa (his foster brother who worships him), Vrishali (his wife) and Krishna, with whom Karna enjoys a curious and perplexing similitude and a mystic link. Karna is the hero: “The discussion on Shivaji Sawant’s Mrityunjaya will remain incomplete if in this context another work is not referred to. The critique written on Mrityunjaya by a Calcutta civilian Pradip Bhattacharya IAS, has behind it not only his own research on the Mahabharata but also the two Hindi and English translations of Mrityunjaya. He has examined how Shivaji’s Karna differs from Sawant’s Karna, where Shivaji has departed from facts to establish the greatness and sublimity of his creation, Karna, nothing has escaped Bhattacharya’s eye. Still, he remains an admirer of Sawant’s genius…Bhattacharya’s scholarly critique has brought the hapless Karna even closer to us.” Neeta Sen Samarth, DESH. “Pradip Bhattacharya brings to the difficult if fascinating task the resources indicated in his “The Secret of the Mahabharata” and “Themes & Structure in the Mahabharata: Adi Parva”…it leaves one with a feeling of joy and satisfaction.” Dr. K. R. Srinivasa Iyengar, The Hindu. “This is the real microscopic literary valuation of Mrityunjaya. My heartiest congratulations with thanks to him. Here he has taken a deep dive like the author into the character of Karna. He has suggested some very essential corrections… done full justice to the magnum opus literary creation.” Shivaji Sawant, author of Mrityunjaya. Echoes of the Epic: “a welcome venture…an estimate at once objective and highly readable, Bhattacharya’s scholarship on the Mahabharata being commendable and his study of Sawant’s work being sincere…The critic has done well by pointing out a couple of errors made by the translators.” Prof. Manoj Das, The Hindu. “Highly incisive, critical yet objective critique.” V. Subramanian, Pratibha India.